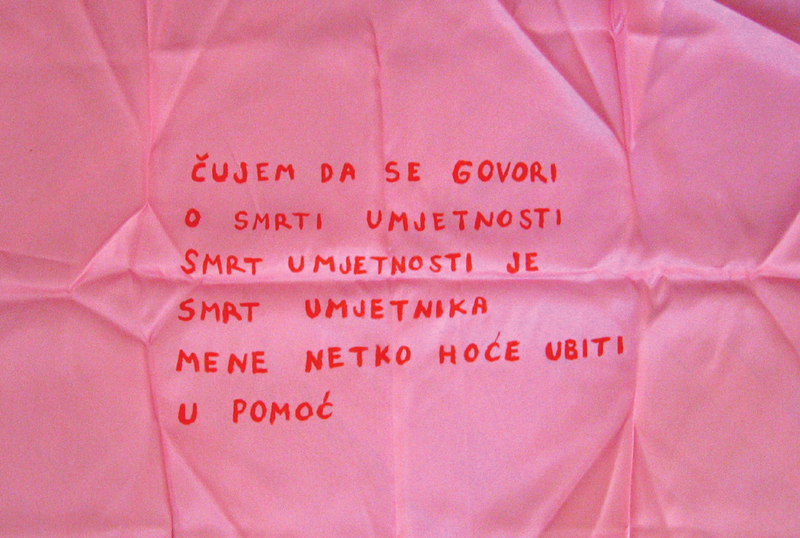 (…) Four interconnected works are of textual nature and simple execution: short statements are written on monochromatic fabric background. With their form reminiscent of obituaries, advertisements s or flags, these works are exploring the end and the death of art through their lapidary, fragmented, consciously ambiguous and absurd language. 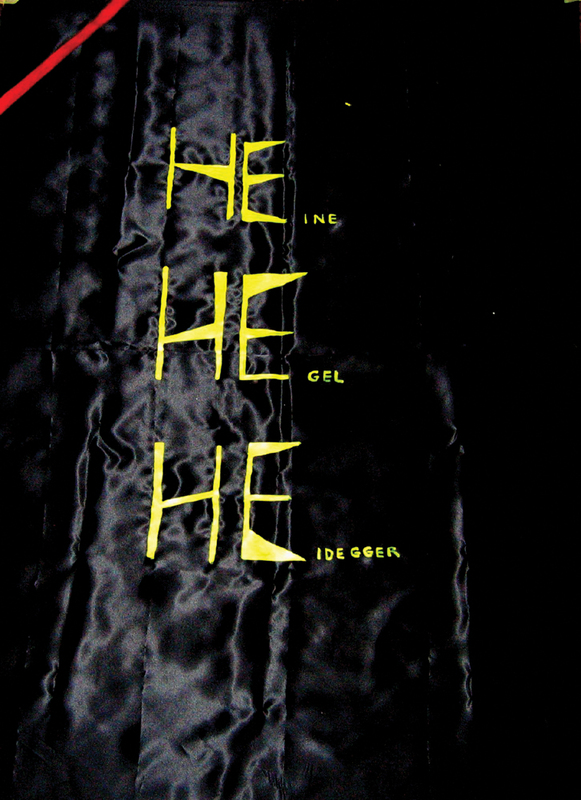 “HE-HE-HE” originated through witty emphasis on the first syllables of the last names of famous German philosophers Heine, Hegel and Heidegger, who all advocated the thesis of the end of art. 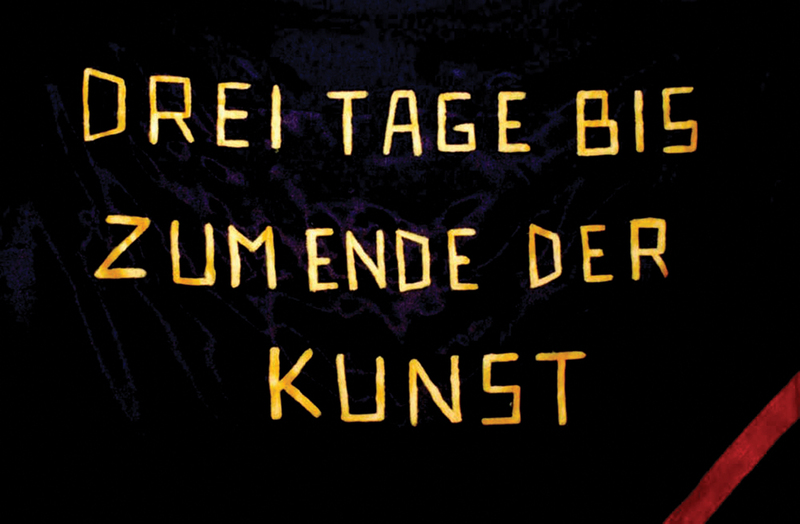 The timeless perspective imposed by tautological use of linguistic time attributes in “Drei Tage Bis Zum Ende Der Kunst” (Three Days until the End of Art) becomes additionally radicalized with absurdity of arbitrary time contextualization. In “I’m Selling M.D.” the linguistic performance of selling and buying, a frequent topic in artist’s work – is related to Marcel Duchamp, one of the most important artists of the twentieth century. Next to the works-statements there are small papers (looking like reminders) with different handwritten quotations, statements and thoughts, through which the artists is commenting and contextualizing exhibited works. Through putting philosophical and poetic language in contrast to personal introspections or found phrases he is playing with the different meanings that are canceling or supplementing each other, thereby becoming increasingly complex… For example, to quotations of famous philosophers (Wittgenstein, Hegel), art theoreticians (Gadamer), artists (Duchamp), poets (Pavese, Przyboš, Dickinson…), Stilinović adds comments which he directs to himself, thus questioning his own artistic responsibility and motivation (I am presenting other people’s cynicism. I am not responsible for behavior of others. But if you exhibit it? Should we sell death?…), as well as faceless phraseology of typified language of Microsoft text messages (Total time, Please wait, Never show this message again..). Stilinović is playing with different paradoxes related to the topic of the end of art, with a clear emphasis on critical deconstruction of hegemonic concept of grand narrative and canon of Western Art. Stilinović closes the topic of the exhibition through juxtaposing metaphorical, speculative death of art with concrete death and question of crime and genocide, thus radicalizing the matter of the art’s function. Presented in the basement space of the Gallery Nova, the work “Srebrenica” opens up subjects of indifference, oblivion and political cynicism. 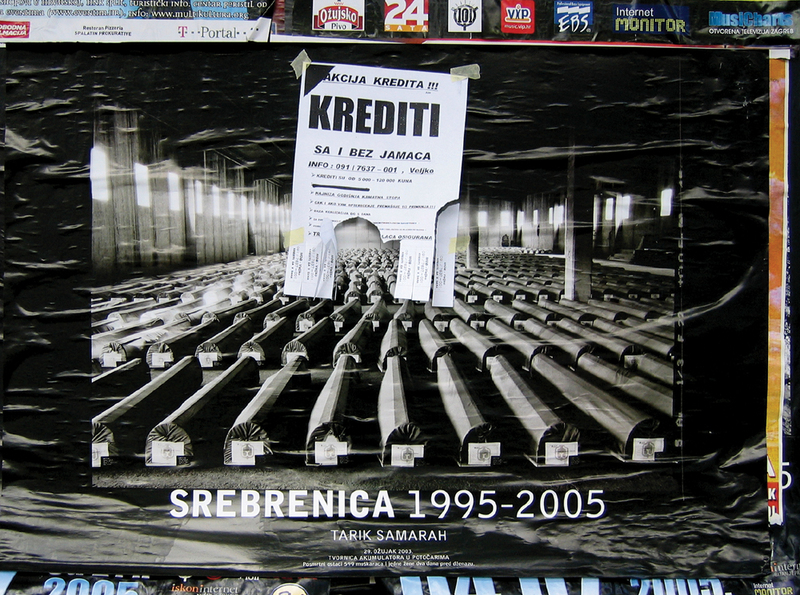 The work is showing commemorative poster that appeared on the streets of Zagreb on the occasion of tenth anniversary of massacre in the area of Srebrenica, in which over 8.100 Bosnian Muslims were killed. 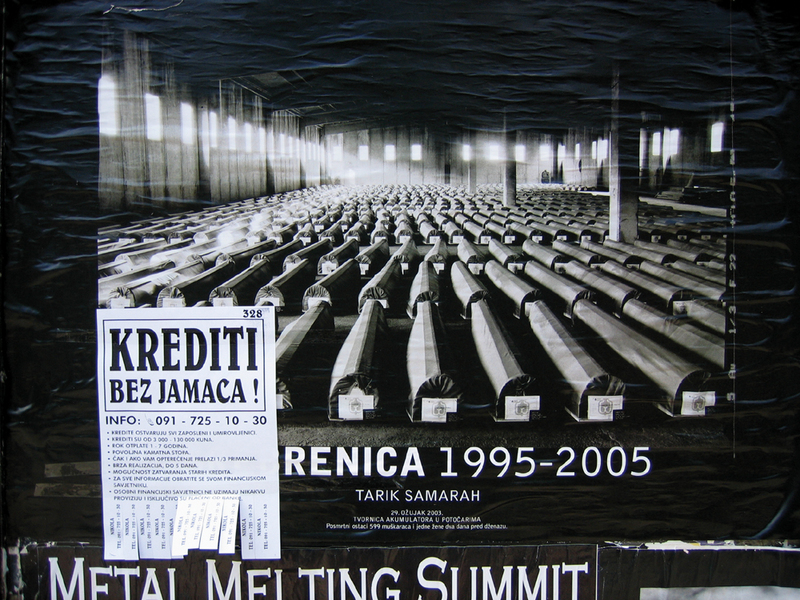 The photography taken on 29th March 2003, in the accumulator factory in Potočari, close to Srebrenica, shows coffins of 600 victims waiting to be buried after the exhumation of a mass grave. Stilinović photographs the obscenity of the situation in which he finds that photography, integrated into quotidian normalization context, equally determined by consumerism and by chronic lack of solidarity and political imagination. If we look at work of Mladen Stilinović in the context of thirty years of practice, we have to notice the lack of the time perspective. Repetition as a way to “survive death” – in this respect functions as artistic, but also as political option of canceling the forgetfulness as an “effect of a mind too alert”– as noted by Adorno in his text “What Does Coming to Terms with the Past Mean?”, which is exploring the relationship between the art and the holocaust. The somber conversation of this exhibition goes on in context of genocide, cynicism, economy and indifference, and it is being formed in double tension, between impossibility of talking and impossibility of being silent. Adorno’s thesis that one can come to the terms with the past only when one removes its causes is still pressing today; economic and political interests that formed Fascism exist to this day, only with different national, political and racial undertones. In opposition to romantic or modernist notion of the artists as a cultural hero of sorts, Stilinović talks about the key social matters and the question of art’s positioning towards them through the metaphor of artists as a – dog. The exhibition is titled WUFF-WUFF after one of the exhibited works, and through this gesture Stilinović again reaches towards performative role of language, and invests into fundamental difference between human and animal speech. In the process of becoming the subject of speech the man goes through the symbolic castration and gives up completeness which is not denied to animals. Although dog has fundamentally different approach to language, neither he has escaped it, as Lacan noticed. 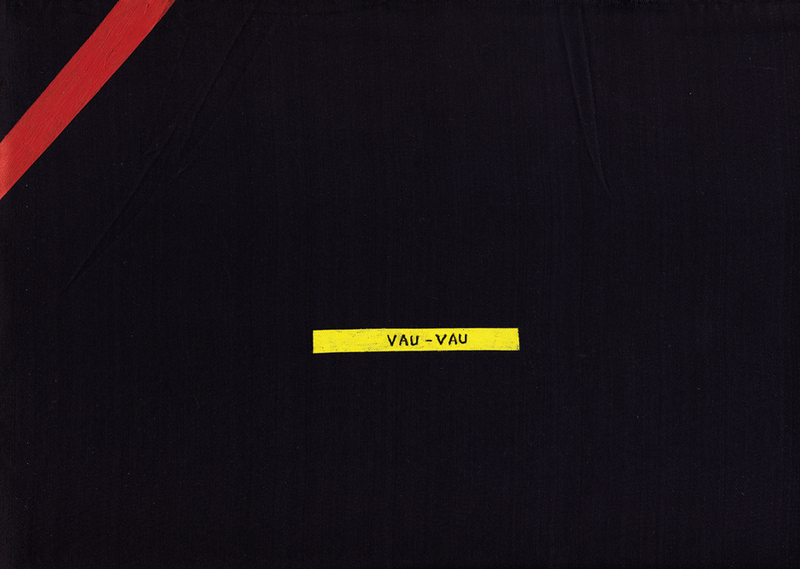 But contrary to the man, dog talks only due to an intrinsic need or pressure.1 In this respect, VUFF-VUFF should be understood as a final artistic gesture, the one which is at the same time capable of talking and being silent, of addressing us with urgency of establishing relationships and escaping language.